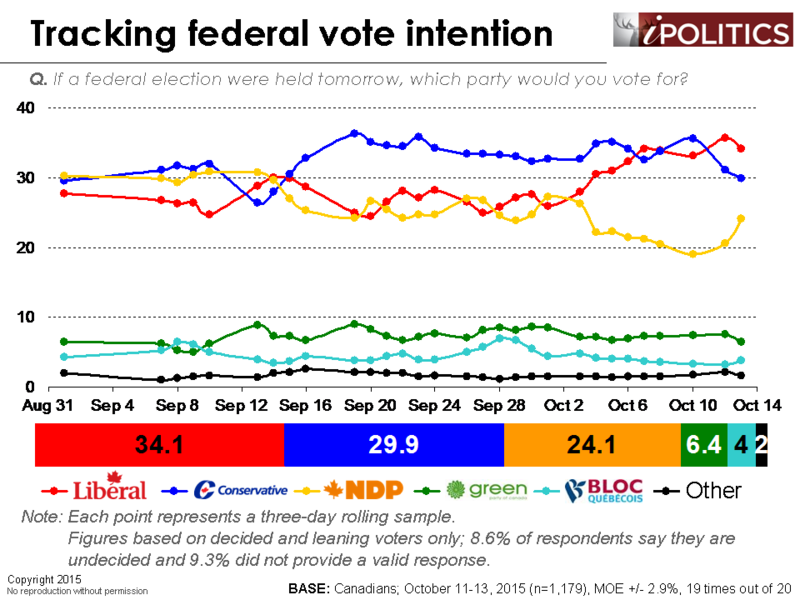 [Ottawa – October 14, 2015] We’re less than five days away from Election Day and the Liberals are maintaining a small but stable four-point lead over the second-place Conservative Party. The NDP is in third place, but the party is up almost four points over yesterday and may be showing signs of resuscitation after its decline over the last month. The NDP is doing significantly better in Quebec, where the bloom is off the rose for the Conservative Party, who at one point seemed to be gaining ground over cultural and values concerns. Ontario is swinging decisively Liberal and the Conservative Party is likely to lose seats here, despite the prospect of vote splitting among centre-left voters. British Columbia remains a four-way race and the NDP may be recovering here. Support for the Conservative Party rises progressively with age and the party retains a clear lead with seniors, although this advantage might be shrinking. 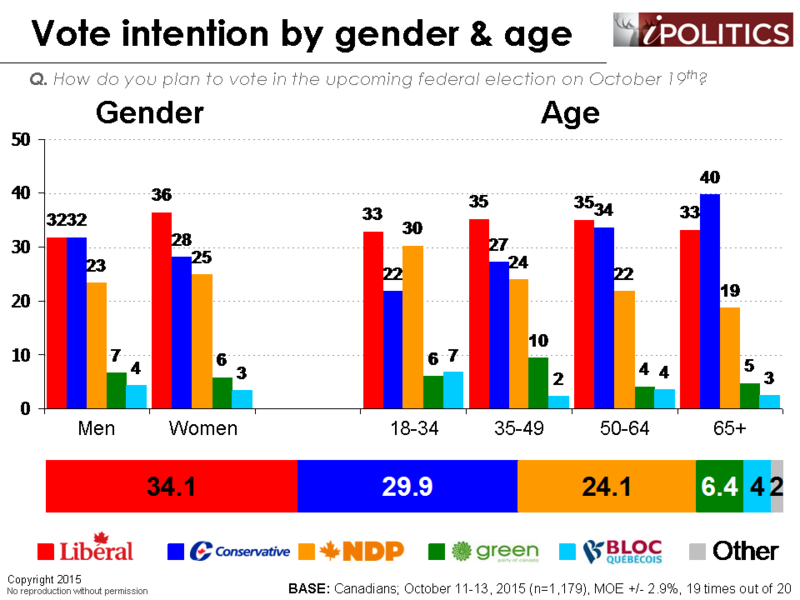 In a stark contrast, NDP support declines with age. What is remarkable about Liberal support is how balanced it is across age groups. The data on second choice provide some insights into each party’s potential for growth. 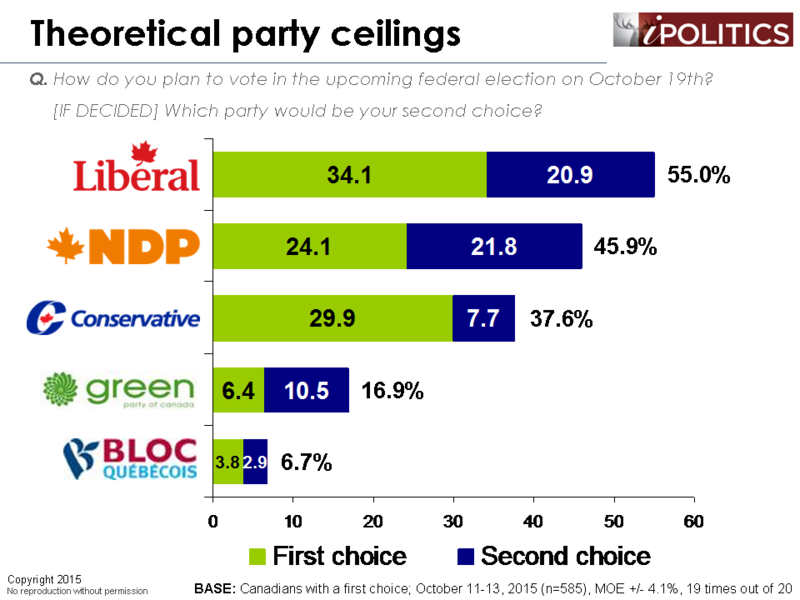 If we combine each respondent’s first and second choice, the Liberal Party has a theoretical vote ceiling of 55 points. In a speech earlier today, Justin Trudeau asked Canadians for a majority mandate and these findings suggest there are certainly enough potential Liberals out there to make this happen. The NDP has a vote ceiling of 45 per cent meaning that while the party is still ten points off the lead, they still have plenty of headroom. The Conservatives, however, have a vote ceiling of just 38 points meaning that even if Stephen Harper could (improbably) convert every second choice voter to his camp, his party would still fall short of a majority. All in all, the Liberals hold a clear advantage and, more importantly, this lead is stable. If Stephen Harper is not able to improve his party’s standing over the next day or two, it is highly doubtful that he will be able to get the strong minority he’ll need to retain power, let alone a majority. The figures in this report are based on a three-day rolling sample. Each day, a new day’s worth of interviewing is added and the oldest day is dropped. The field dates for this survey are October 11-13, 2015. * In total, a random sample of 1,179 Canadian adults aged 18 and over responded to the survey (1,030 by HD-IVR, 149 by live interviewer). The margin of error associated with the total sample is +/- 2.9 percentage points, 19 times out of 20. *Note that due to the Thanksgiving holiday, we did not run the live interviewer portion on Sunday, October 11th or Monday, October 12th. i think maybe you were undersampling them. 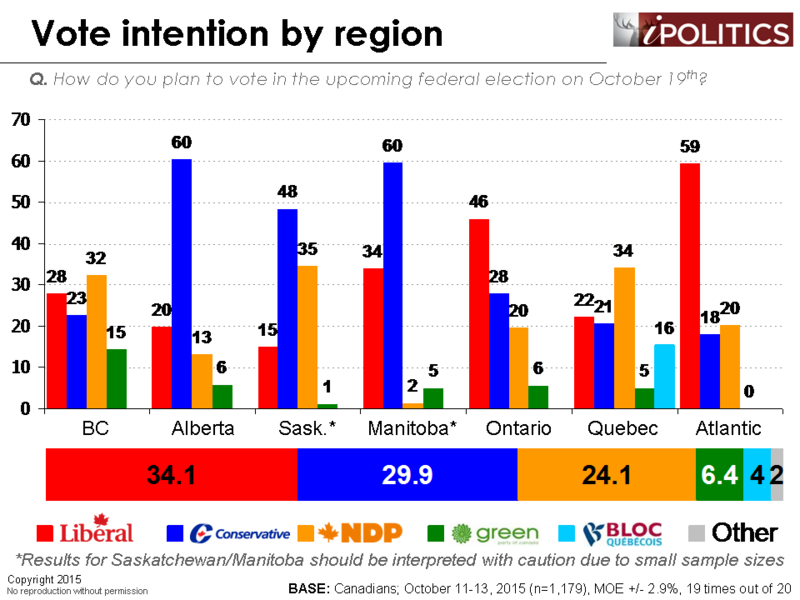 that ndp bump in saskatchewan, especially, makes sense, in terms of strategic voting. and, the fact that you’re broadly in line with nanos is nice in terms of developing a little consistency. I sure hope so. Surely Saskatchewan is NOT voting for Harper. Tell me it isn’t true. well, urban saskatchewan, anyways. i wouldn’t put your hopes in the ndp winning those rural ridings. in the end, it’s just a handful of seats. but you have to know the liberals are not competitive, outside of ralph’s riding. that 15% may be solely ralph’s riding! Have to laugh at those wildly optemistic Lieberal share of the vote in Ontario. I see the NDP is building momentum again taking vote share from the Liberals. Well, it’s actually in line with the other companies. yeah, and the liberals are up over the last ekos poll. 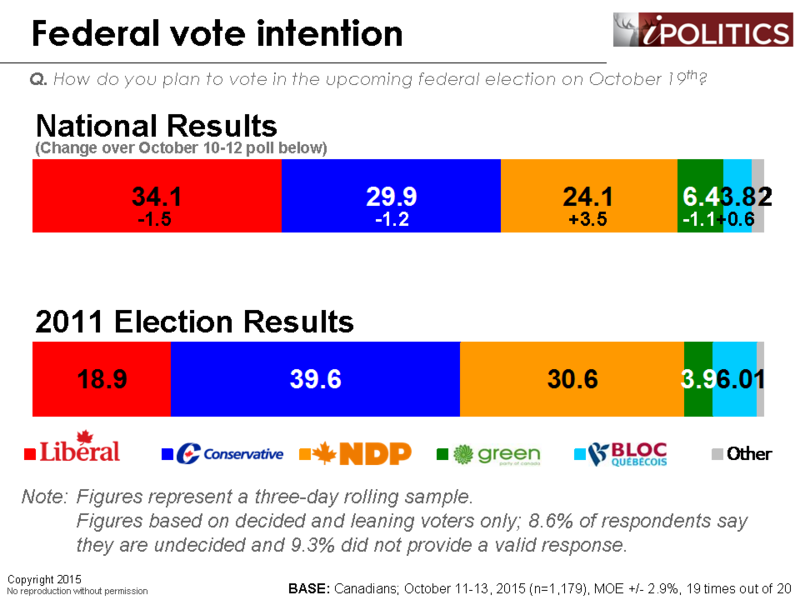 …and the polls consistently got the liberals and ndp about right, but overestimated conservative support. that was enough for a liberal majority in ontario. the ridings are not identical, but they’re close enough to ballpark it. that would convert to 64 federal seats at 38.65%. with the conservatives and ndp both running lower, and the liberals up almost ten points on it, i don’t think 75-80 seats is an unreasonable projection. that said, that brick wall of rural ridings is a real thing and there may be a kind of ceiling, where it no longer matters much if they get 43% or 48% or 52% even in terms of seat totals. they’d have to really push higher to start thinking about winning those seats. they may be nearing that ceiling, or may be past it. these uniform swing models are going to be brutal at correctly distributing a 30+% swing. you’re going to see 50% swings in some ridings, and 5% swings in others. it matters less with a 6% swing or something. but, this is huge and they will get a lot of it wrong. i saw some polling in larry miller’s riding that suggests the liberals are in striking distance, but there’s some extra circumstances there that are probably not transferable to other rural ridings. but, if they’re running that high, and the ndp are down, then you need to look at them maybe winning a few long time ndp seats. maybe. don’t anybody get their hopes up. maybe even in the north. and, if the conservatives are running under 30 then the entire ring around toronto swings or is at lest very close – brantford, kitchener, newmarket, barrie, peterborough…i think that’s where you start seeing those 40-50% swings…. it would be useful for grenier or whoever else is doing this to come out and say this, so strategic voters understand to be extra careful with the model this time around. with a 30% swing in ontario? you can’t use a uniform swing. it’s just too big. and, a uniform swing in alberta makes little sense in the smallest of changes. Actually, the Conservative vote federally tends to be underestimated by the pollsters. i agree that this was an anomaly. but, the last provincial election in ontario consistently had the conservatives at or above 35. grenier had them at 35.8, with a minimum of 32.8. that led to a prediction of a liberal minority. my best guess on that is low turnout. see, here’s a twist pollsters haven’t yet considered: they claim the over 65 is more likely to vote. i don’t disagree. but is the over 75 more likely to vote? can they get to a polling station? my guess is that what happened in ontario was they oversampled the really, really old voters, and they just couldn’t get there to do it. and i might suggest that’s something to be aware of. now, does that mean i’m suggesting 28 is exaggerated? probably not. but i wouldn’t expect harper to outperform hudak, either. it’s a valid question, though. the demographics are 65+. but, your average 65 year old is mobile. your average 80 year old is not. how much of the sample is 65-80, and how much is 80-100? there’s a whole host of issues with the oldest voters, which are a substantial and increasing percentage of the population. will they remember what day voting day is? will they be too sick or sore that day? might their kids decide to not let them vote, due to disagreements? this is a provincial map, with the liberals at 39% and the conservatives at 31%. you can see what i’m saying. grenier’s map (with a uniform swing with the liberals at 42 and conservatives at 42) has the conservatives winning a lot of those ridings, and the liberals overperfoming in places like haldimand. that’s because he’s applying the swing evenly, which is probably underestimating liberal support in the places they won provincially and overestimating it in the places they didn’t. i would be more likely to bet on the provincial map being closer, which is going to bet liberals seats in brantford, cambridge, kitchener, thornhill, milton, flamborough (maybe; the riding splits), burlington, newmarket, barrie, durham, peterborough, northumberland – it’s a nearly clean sweep all the way around toronto. and, you add it up, and it gets close to 80.
sorry, the projection map is with the liberals at 42 and the conservatives at 32, clearly. but i’m really checking to see if everything is getting moderated, or just the posts with links. Usually the over 70 vote tends to be Liberal again, it’s just the 50-70 which is Conservative. A low turn-out always favours the Tories and a high turn-out means usually more young and progressive people voting. I also agree that the swing in Ontario, Quebec, Alberta and Manitoba is not proportionally and should be concentrated in places like Calgary and Winnipeg. For Ontario I predict a lot more ridings flipping outside of the GTA (with almost the whole GTA going Liberal), the whole Peterborough, Quinte Kingston stretch, Southern Durham, pretty much all of Kitchener and a stretch from Burlington and Oakville going down to Haldimand-Norfolk. On a real bad day for the Conservatives, they will also loose St.Catharines and Bruce-Grey-Owen Sound. For Quebec I think the Conservative as well as the Bloc numbers are way overstated and with the Conservatives having their vote concentrated in the Beauce only it doesn’t look so good for the Quebec city area anymore. I believe… Harper for PM 2015. We’re in it till the end. What “end” is that? The Armageddon and the Rapture end that he’s working on? I believe that George W. Bush was a “born again” as for dear and gentle Stephen Harper. Amazing how the lord seems to love oil and money. 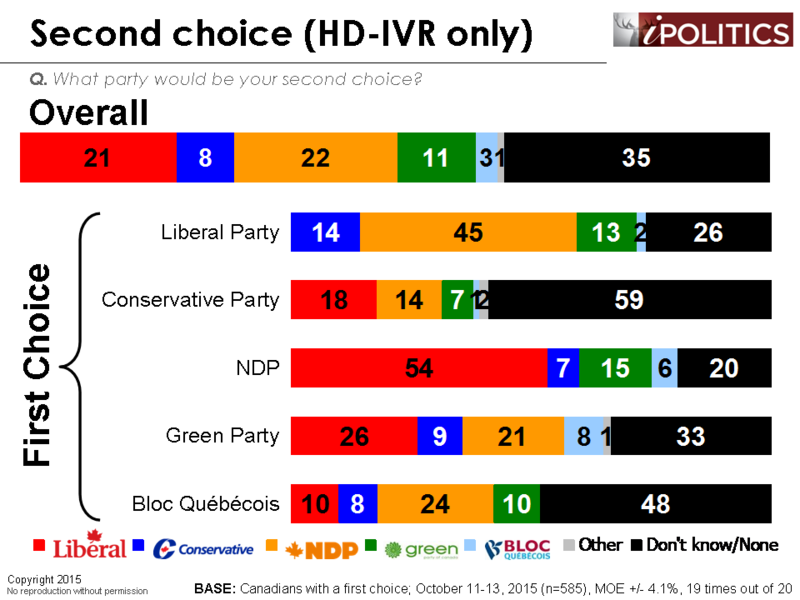 BC: NDP leading in the early 30s; Libs and CPC, in that order, in the 20s; and a strong fourth party in the mid-teens. Québec: NDP leading in the early 30s; Libs and CPC, in that order, in the 20s; and a strong fourth party in the mid-teens. Are you sure that the website is correct about the NDP support being at 2% in Manitoba? The results are correct, but we would advise against reading too deeply into the day-to-day results in the smaller regions, particularly Saskatchewan and Manitoba. The Manitoba results here are based on 42 cases, which gives you a 15-point margin of error, meaning they could easily be as high as 17 points. NDP support in Manitoba of 2 percent +/- 15% = +17 to -13, correct? In other words, does the +2% number have any significance? Seems that the sample size makes this number irrelevant. Is that 42 cases per day, or 42 over the three days? What if anything is being done to account for those who have already voted? Are you asking that question? Does it matter? Were these numbers pulled out of a hat? The 2% figure for NDP support in Manitoba is ludicrous. The lopsided Liberal lead in Ontario is just a bit suspicious as well. The best solution would be to ban political polling during all elections. Many of the pollsters seem to have ulterior motives. The Liberals lost me. My vote is now going to the NDP for sure. As long as you don’t vote for Harper! How does this poll deal with the undecided vote? Does it force the undecided to choose by not offering the ‘undecided’ option? If that is the case, how does the poll deal with that un-certainty of forcing people to make a selection they really have not made? What is the percent undecided? Trudeau made a big mistake asking for a majority. People realize that He is not up for majority govt, Very bad He just hand elections to harper becaused he ressuscitate the NDP> huh! If mistake there is, might not be a great one though. The other two parties have asked voters for a majority. But it’s suddenly not OK for the Liberals to do this? What I found odd about it was he said it in French (he was actually responding to a question) But when the media asked him to repeat the answer in English, he refused. It is dangerous to do as Harper found out in 2004. It could, COULD cause some voters leaning Liberal who are OK giving him a minority to see how he does as PM, to become uncomfortable with the thought of giving him a 4 year run right out of the gate. Living in Montréal, I seriously doubt the regional sample for the Quebec region. Harper will win the most seats across the country. Remember how the Liberal vote collapsed in 2011 because it will happen again and Iffy was a far superior politician to Turdeau. I have watched polls all my life. I think we are beginning to see a break in these numbers and as usual there is always an overinflated vote and an underinflated vote. 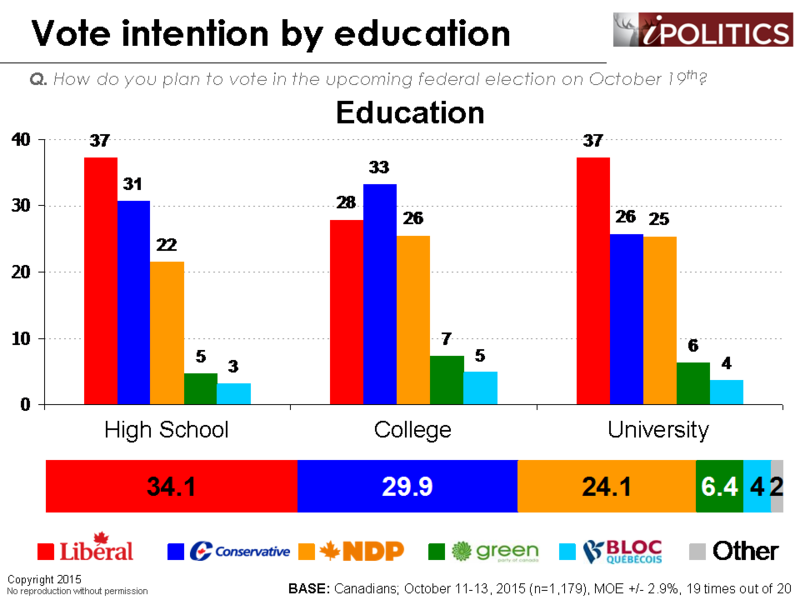 Nationally by Monday the NDP vote will strengthen as undersampled young voters strengthen that. Also the Liberals vote is strengthening same reason. There is a very good chance if the vote splits work wrong in Quebec City/rural Quebec/ 905 belt/ and lower mainland that the Conservatives bottom out. Of course that would make a Liberal majority and the NDP much closer to Conservatives at the end. I do not have much confidence in the Consevative vote in Ontario outside Toronto today right now…may change but I think we are not going to have as interesting a finish as we thought 4 weeks ago. The Liberal vote didn’t collapse in four days in 2011. I know you would like it to, and I would like the NDP to rebound. But neither of those things is going to happen. The pro change voters have made their choice. Strategic voting is working, whether organized or not, and Canada will be a better country on Tuesday. Also, your turning the manes of people you don’t like is adolescent. Are you 12? Sorry for the typos. Should read, the turning of names into insults is adolescent. A strategy that I question is the NDP. They should be telling voters that if Trudeau wins he will go ahead with Harpers trade agreement. A vote for either the Conservatives or Liberals is a vote for the trade deal. The Liberals with a minority even would get in bed with Conservatives to pass that deal. Only the NDP can stop it…he needs to campaign on that and bill C-51 because the other two parties will just keep those…thats a big missed opportunity for the NDP to differentiate themselves with the progressive base.